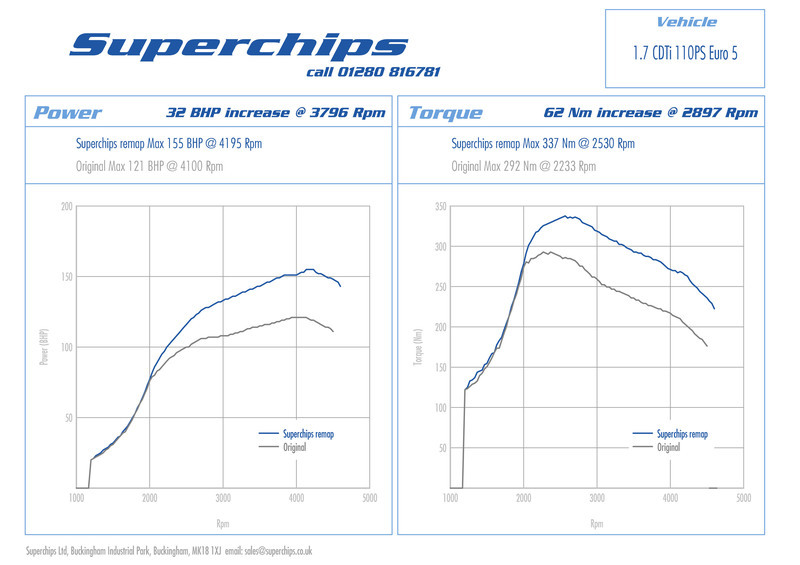 Superchips Ltd has a long history of extracting power increases from Vauxhall turbo diesel products and the firm’s latest release for the Euro V version of the 110PS 1.7 CDTi Astra is no exception. Available now on Superchips’ market leading Bluefin ‘Plug in and go’ DIY programming handset for easy installation in a matter of minutes , the Superchips ECU remap adds an impressive 32bhp at just 3796rpm, which makes the Astra feel considerably more lively, particularly during spirited driving. The Superchips ECU remap also greatly improves the Astra 1.7 CDTi’s torque output, as it releases an extra 62Nm at 2897rpm, enabling Vauxhall drivers to enjoy swift, effortless progress with fewer revs, less gearchanges but more MPG. That’s because if driven in a ‘like for like’ manner with a standard car, a Superchip equipped 110P S Astra 1.7 CDTi can record fuel economy improvements of up to 7%. The Superchips Bluefin ECU remap for the September 2009 onwards versions of the Euro 5 110PS 1.7 CDTi Vauxhall Astra is available now at the special sale price of £345.00 including VAT and installation. It’s also available from your nearest Superchips dealer for customers preferring a ‘drive-in, drive out’ service. ← Make your Land Rover Discovery 4 Commercial crisper with a Superchips remap!